The Burkini: A Closer Look At The Swimwear That's Making Headlines : Goats and Soda This has definitely been the summer of the burkini. Here's some background on the swimwear that's launched a worldwide debate. 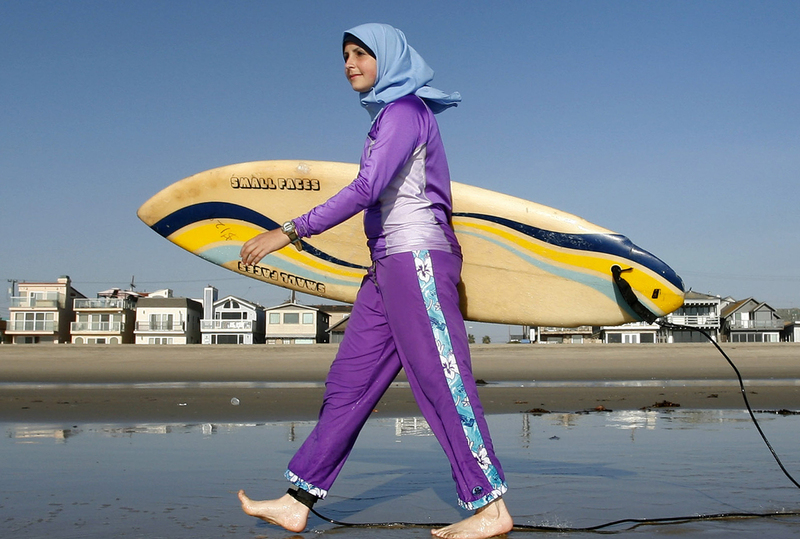 Sama Wareh walks along a California beach in swimwear designed for Muslim women. The photo is from 2007. The burkini has had a controversial summer in France. A number of towns along the Riveria banned the burkini — a portmanteau of "bikini" and "burka," and a type of swimwear — in the wake of the deadly Bastille Day attacks in Nice. Officials argued that the body-covering swimwear isn't in line with France's secular views; French socialist prime minister Manuel Valls called the burkini "a symbol of the enslavement of women." Critics of the ban did not agree that the burkini is a symbol of oppression or extremism. The latest twist was the Friday ruling from France's highest court, addressing the ban in one town. The court suspended the ban, saying it "seriously, and clearly illegally, breached the fundamental freedoms to come and go, the freedom of beliefs and individual freedom." Here's a closer look at the swimsuit that launched a worldwide debate. The burkini was created by a Lebanese-born Australian woman. Aheda Zanetti is credited with inventing the alternative swim gear in 2004 to accommodate a hijab-wearing niece who wanted to play sports. She's even trademarked the name "burkini." Zanetti says she strove to make something that made modest dress work with the active Australian (and beach-focused) lifestyle. Zanetti's designs aren't the only option. Companies from Jordan to the USA, like Veilkini, East Essence and YEESAM also offer modest beachwear. The goal of the burkini is to marry swimwear with Islamic values. Practicing Muslim women follow the Koran's call to "cover and be modest" in dress. Zanetti's Ahiida brand makes a few different types but all have the following elements: a long-sleeved tunic with a knee-skimming seam and an attached "Hijood" head covering and pants. They come in a variety of colors and patterns, including deep plum with a swirl design and a silver look with multicolored stripes. The fabric, 100 percent polyester, is lightweight, resistant to chlorine and quick-drying — and provides UV protection. The burkini leaves only the face, hands and feet visible. Muslim women aren't the only ones to favor modest swimwear. Western swimwear has evolved dramatically over the centuries — in the 1800s, suits covered most of the female bather's body. Meanwhile, Orthodox Jewish women have strikingly similar swimwear. As for the burkini — and do-it-yourself variations — they're part of the beach scene in India, North Africa and other areas where Muslims live (and swim). The public outcry against the ban has been huge. Muslim women from across the world have some common refrains: The ban is sexist, Islamophobic and, above all, extreme. "France's way of battling this extremism is with an extremist act," said Nayema Jilani, a British Muslim woman interviewed in a video on the topic done by the Huffington Post. The ban isn't only an issue for Muslim women. Protesters threw a beach party at the French embassy in London on Thursday, complete with burkinis, sand and inflatable toys. An Algerian man dubbed the "niqab Zorro" has offered to pay the fine for any woman ticketed in France for sporting a burka or a burkini. Backlash looks as if it's good for sales. Some may be protesting the burkini ban with their wallets. Zanettii cited 60 online orders last Sunday compared to a typical 10 or so per day. A burkini will set a shopper back anywhere from $30 or so to about $100, depending on size and style.